In the various films about exorcism casting out a demon is not so easily accomplished by those who follow Jesus, especially in The Exorcism of Emily Rose. Faith in Process, Bruce Epperly, 2018. Commentary and Spiritual Perspectives, Ordinary 4, 2015. Commentary, historical background, poems and readings. Center for Liturgy, St Louis University. Español. "Separating a Man from His Cage," D Mark Davis, Left Behind and Loving It, 2015. With Authority/Power to Do, Kathryn Matthews Huey, SAMUEL, UCC, 2015. Points for Preaching and Teaching, 2015. The Lectionary Lab, Epiphany 4, the Rev'ds Dr. John Fairless and Delmer Chilton (aka "Two Bubbas and a Bible"), 2012. Disclosing New Worlds, commentary and reflections, Lawrence Moore, 2015. Preaching the Healing Narratives in Mark. Evangelectionary, Peter Bush, Evangelism Connections, 2015. The Adventurous Lectionary, Bruce Epperly, 2018. Ministry Matters, February 1, 2015. Girardian Reflections on the Lectionary, Epiphany 4, by Paul Nuechterlein & Friends. Jesus Now, Epiphany 4B. Lectionary, study and worship resources from Faith Futures Jesus Then & Now. Rumors, for February 1, 2009, Ralph Milton, "Sermon helps for preachers with a sense of humor." Social Justice Lectionary, links by Rev. Dr. Bruce Sweet. Sermon Brainwave, Lectionary podcast featuring Profs. Rolf Jacobson, Karoline Lewis, Matt Skinner, discussing the week's passages in light of current events. At Luther Seminary's WorkingPreacher.org. 2015. "First Things First," David Lose, ..in the Meantime... 2015. "Blessing for a Whole Heart," Jan Richardson, The Painted Prayerbook, 2015. Use of images. RCL commentary and discussion, RevGalBlogPals, 2015. 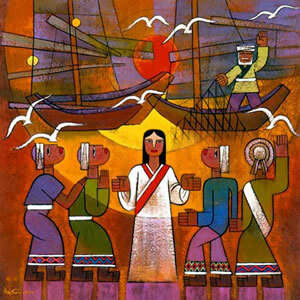 "There Is No Them," Dan Clendenin, The Journey with Jesus, 2015. 2009. "The Unclean Spirit Challenges Jesus," Andrew King, 2015. "Authority and Authenticity," Suzanne Guthrie, At The Edge of the Enclosure, 2015. "Mark Is In a Race to Drop the Mic," Mike Stavlund, Question the Text, 2015. "The Good Life: Psalm 111 and Stewardship," Sharron Blezard, Stewardship of Life, 2015. "Prophetic Veracity," Sermon Stories for Epiphany 4, 2015. "Teaching, the Jesus Way," Melissa Bane Sevier, Contemplative Viewfinder, 2015. "As One Possessed: Recognizing Jesus," Janet H. Hunt, 2015. "Disturbing Authority," Thomas Beam, 2015. "Monsters under the Bed," Linda Fabian Pepe, Theolotical Stew, 2015. "Conveying Authority," Lynn Miller, Art & Faith Matters, celebrating our creative and living God by generating art and architecture resources for congregations and individuals. Art and Faith Matters facebook page contains additional resources. "True Authority," Bob Cornwall, Ponderings on a Faith Journey, 2015. "The Accidental Prophet and Healer," Bob Stuhlmann, Stories from a Priestly Life, 2015. "Jesus of Nazareth Went to Capernaum," poetry, Scott L. Barton, 2015. "Building up, not puffing up the church," Katerina K. Whitley, Sermons that Work, Episcopal Digital Network, 2015. 4 Epifanía (B) – 2015 por el Revdo. John J. Lynch, Sermones que Iluminan, 2015. "The Law of Love," Frederick Buechner Sermon Illustrations. "A Space with a Different Spirit," Epiphany 4B, Revd Dr. Lance Stone, Emmanuel United Reformed Church, Cambridge, 2009. "Sermon for the 4th Sunday after Epiphany," the Rt. Rev. William Burrill, Day 1, 2000. Bible Study, Epiphany 4B, 2015, Susan Butterworth, Sermons that Work, Episcopal Digital Network. Estudio de la Biblia. Epiphinía 4B, por Susan Butterworth, Sermones que Iluminan, Episcopal Digital Network, 2015. Lectionary Notes, Epiphany 4, Rev. Beth Quick and the Lectionary Chat Group Bible Study of St. Paul's UMC, Oneida, NY. "An Attitude of Discipleship: Openness," John and Robin McCullough-Bade, Daily Discipleship Bible Study, Evangelical Lutheran Church in America, 2009. Lectionary Liturgies, Epiphany 3B, 2015, Thom M. Shuman, Presbyterian Church (U.S.A.). LCA Worship Planning Page, Epiphany +4, 2015, "Everything lay-readers need to prepare worship". Mustard Seeds, "Power and Authority," Epiphany 4B, 2015. A lectionary-based ideas resource for leaders of contemporary worship, Ann Scull, Gippsland, Australia. The Worship Closet, Epiphany 4B, Creative Worship Ideas, 2012. Liturgy for the Celebration of Life, Epiphany 4B, 2012. Liturgies from a Progressive/Post-Liberal Theology, Revd Rex A.E. Hunt, Uniting Church in Australia. Worship and Liturgy Resources, Ordinary 4 - Epiphany 4, by Rev David Beswick, Uniting Church in Australia. Sermons and Liturgies for Year B, Richard J. Fairchild, United Church of Canada. Prayer for Epiphany 4, Healing Prayers, MomPriest, RevGalBlogPals, 2009. The Timeless Psalms: Psalm 111, Joan Stott, prayers and meditations based on lectionary Psalms, 2015. Call to Worship, January 29, 2012, Mary Jane Konings, Timaru, New Zealand. Prayers of the People for All Epiphany, Rick Morley, 2012. Liturgy Link, liturgy collaboration, 2015. Prayers of the People, Epiphany 4B, Lowell Grisham, St. Paul's Episcopal Church, Fayetteville, Arkansas, 2015. HermanoLeón Clipart, Ordinary 4. Free clipart, backgrounds, slides, etc. Clip Art Images: Mark 1:21-28, Misioneros Del Sagrado Corazón en el Perú. Ordinary 4 at Cerezo Barredo's weekly gospel illustration. Follows Latin American Roman Catholic gospel reading, though most gospels texts/themes are found in the index. Liberation emphasis. Clip Art, Ordinary B4, Fr. Richard Lonsdale, Resources for Catholic Educators. Bag of Candy, Dollar Store Children's Sermon, John Stevens, 2015. "The Superbowl and the Church in a Culture of Dominance: 1 Corinthians 8:1-13," Matthew L. Skinner, ON Scripture, Odyssey Networks, 2015. Video: 5 Things You Didn't Know About America and Violence. "Jesus of Nazareth Went to Capernaum," Scott Barton, tune from Mozart Piano Sonata no. 11 in A Major, K.331, Arranged by Dr. Arthur Frackenpohl. Hymns of the Spirit Three, Epiphany 4B, Richard E. Hurst, Universalist National Memorial Church. Hymn and Song Suggestions, Epiphany 4B, 2015, annotated suggestions from Natalie Sims, Singing from the Lectionary. Lectionary Hymns, Ordinary 4B, National Association of Pastoral Musicians. Choral Anthem Project, Ordinary 4B, National Association of Pastoral Musicians. Sing for Joy, Epiphany 4, 2009. Choral reflections on this week's lectionary readings, St. Olaf College. 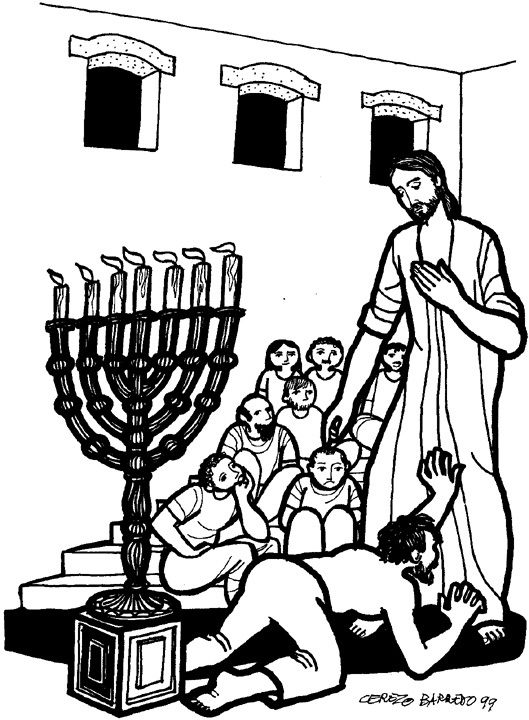 Worshiping with Children, Epiphany 4B, Including children in the congregation's worship, using the Revised Common Lectionary, Carolyn C. Brown, 2015, 2012. Ministry Matters, Epiphany 4B, 2015. Faith Formation Journeys, Epiphany 4B, childrens sermon, 2012.